DroneShield’s cash receipts for the first three weeks of January 2019 were A$728,628. 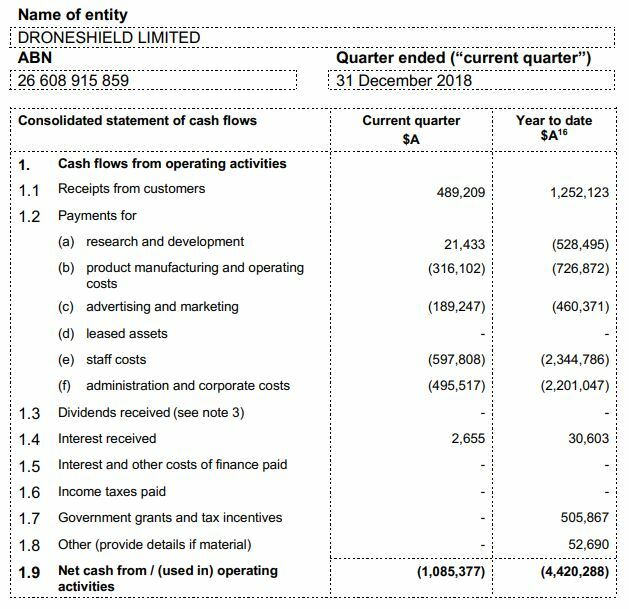 In other words, following the Gatwick events, in the first three weeks of the 2019 calendar year, DroneShield received approximately 50% more in cash than it did during the entire previous quarter. DroneShield believes that, due to the events at the Gatwick Airport in the UK, December was a watershed month for the counterdrone industry. The global recognition of the need for drone detection and mitigation, and the acceleration in the rate of adoption of anti-drone technologies was thus reflected in DroneShield’s financial performance both during the 31 December 2018 quarter, and subsequently to the end of the quarter, during January 2019, prior to the date of this report. The report covers a number of other key developments through to the date of the report, and we encourage you to review it for a detailed look at DroneShield’s substantial progress, and a better understanding of the drone security industry. As you can see from the above figures, the impact is real and tangible on this company. The above chart shows how volatile a small cap like DroneShield Ltd can be, when news breaks. The staff costs and administration costs are close to AUD 1.0m per quarter. And in the past revenues from customers were under AUD 0.5m per quarter. Now the big question is: Can the AUD 0.7m in JAN19 be extrapolated for the entire year, as countries and airports across the globe rush to buy. 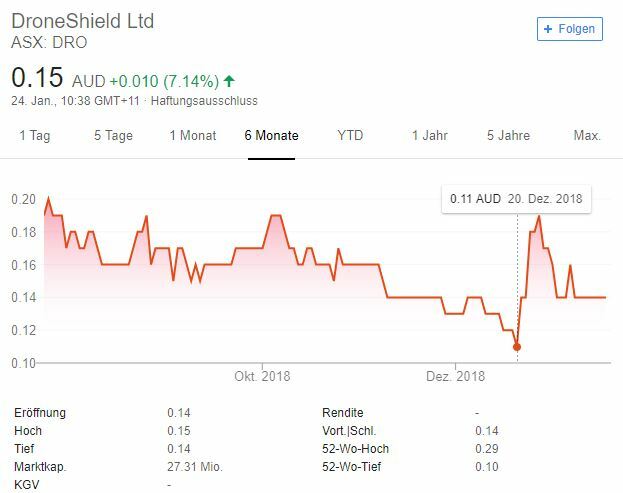 If so DroneShield will be generating over AUD 8.0m in 2019, which would bode very well for investors! And if this trend continues, the company will enter a highly interesting time for investors.